How do you thrive in life no matter where you are in life? If you’re lucky to live long enough, you know that life has many pieces to it. It has the wonderful bits: falling in love, having a career, traveling, following your passion. And it often contains difficult times: illness, divorce, and loss. How you navigate through these different experiences determines how well you thrive in your life. In this program from the Stein Institute for Research on Aging, Dr. Darlene Mininni shares how resilience, emotional intelligence and mindfulness can affect physical health. The motto that most inspires her comes from Job Kabat-Zinn: “You can’t stop the waves, but you can learn to surf.” In other words, good and bad events can occur in life. You might not be able to change the circumstances, but you can learn how to “surf” through them. Dr. Mininni offers practical advice to bring more well-being into your life. 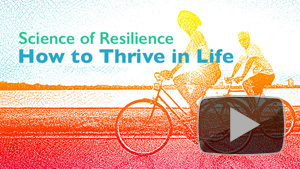 Watch Science of Resilience: How to Thrive in Life. Browse more programs from the Stein Institute for Research on Aging Series.